Have you recently injured yourself in a gym? 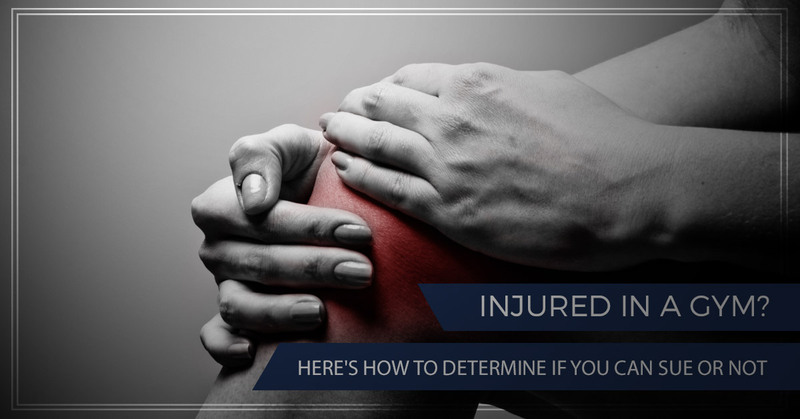 Are you trying to determine whether or not you should sue the gym for any of the injuries you’ve sustained? Before you seek any official legal assistance, make sure you do your research. You want to ensure you have a viable, potentially successful claim on your hands before wasting your time or efforts. In this blog post, we’ll go over a few ways you can determine whether or not you should sue your gym for your injuries or not. Our reliable, qualified personal injury lawyers at The Edwards Law Firm have years of experience defending clients with their personal injury cases. Whether you’ve been hurt in your local gym, in an automobile accident or through medical malpractice, we believe in fighting for those who have wrongfully been injured at no fault of their own. Contact us today to get started. Continue reading below to learn more about whether or not you should think about suing your gym for any injuries sustained while using their equipment or on their physical premises. First things first — refer to your liability waiver. Most gyms require that you sign some sort of legal document, usually a liability waiver, before your membership officially commences. Since it’s very likely that lifting heavy weights or exercising might sometimes result in physical injury, gym owners use liability waivers as a form of legal protection. A total waiver of liability. Essentially, the gym owner relinquishes themselves of any blame for injuries that occur at their gym with this type of liability waiver. Unless the document is written in a way that is overly broad or vague, in which case this waiver would be unenforceable in court, it might be hard to win a personal injury case if you signed this type of liability waiver. A waiver for negligence. Simply put, this prevents gym members from suing for incidents that were essentially accidents, whether caused by an employee or piece of gym equipment. These waivers are usually enforceable in a court of law. Check your contract and see which of these, if any, are covered. If not, you might be entitled to compensation for your personal injury case. For example, if a gym owner knows a certain piece of exercise equipment is broken but still allow individuals to use it, if an individual were to hurt themselves, a lawsuit concerning reckless behavior could be warranted. Like most places you visit, you have the right to assume your gym is a generally safe facility that is properly maintained and inspected. Gym owners are responsible for ensuring this is the case, so if there are any defects or scenarios that could pose potential dangers, it’s their responsibility to fix them. In fact, even if a gym owner isn’t aware of a specific dangerous condition, they could be liable if a proper inspection could have prevented any injuries. Still not sure if you have a viable case on your hands? Reach out to our trusted team of personal injury lawyers for legal assistance! At The Edwards Law Firm, we have a team of personal injury lawyers that can provide you with professional and effective legal counsel. Whether you reside in Tulsa or surrounding Oklahoma communities, our goal is to help you determine whether or not you have a potentially successful case on your hands. If so, we will make sure to fight for your case tirelessly so you can receive the compensation and justice you deserve for your injuries. If after reading this you believe you have a viable personal injury case on your hands, let our team of experienced personal injury lawyers represent your case. We’ve won millions of dollars in compensation for previous clients, and we truly fight for what we believe is right. Contact us today for more information or to schedule your free, no-obligation case assessment. You can reach us by calling (918) 221-0516 or our toll-free number at (888) 600-9836. You can also fill out our online form and we’ll get back to you as soon as possible.